In a secluded and beautiful site in the ancient city of Polonnaruwa lies one of humanities most magnificient artistic achievements. When I first laid eyes on it as a schoolboy many years ago I thought I was looking at a vision from a fairy tale......a fantastic ethereal sight from another world. 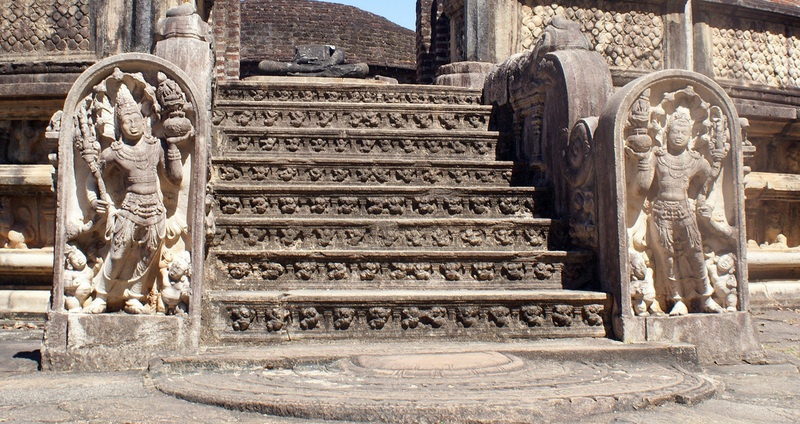 These are the world famous sculptures known as "The Gal Vihara", referred to in the Culavamsa as "The Uttararama". There are two statues of Lord Buddha in the seated and recumbent position, and one of the beloved disciple Ananda in the standing position. The extraordinary skill of the unknown sculptor who executed this masterpiece leaves one at a loss for words. Gazing at the timeless serene expression on the faces of these statues is I found an emotional experience which resounds in the soul like an organ chord. This unknown sculptor brought dead stone to life. Sadly, the Culavamsa does not give us much detail regarding these statues, and this is what the chronicler at the time wrote "Likewise the ruler of men had the Uttararama built. By breaking down the rock, he bringing into play every kind of skilled work , had three grottoes made by expert craftsment." The 'ruler of men' he refers to is King Parakramabahu 1st, and of course, the craftsmen and the master sculptors names are not recorded. Thus we will never know which artistic giant was responsible for this masterpiece. I wish to mention a poignant detail which gives us an insight into the soul and sensitivity of this man, whoever he was. A few years ago the Gal Vihara was being restored under the auspicies of the Cultural Triangle restoration project funded by UNESCO. When the statute of the beloved disciple Ananda (in the standing position) was being restored, workmen found that the sculptor had even carved teardrops under its eyes.....after all this was Ananda grieving over his dying Master. One can practically feel the pain in his heart and the depth of his emotion as he worked the stone. Today the Gal Vihara stands majestic as ever in enchanted surroundings and the world owes this unsung hero a debt of gratitude. The archaeological treasures of Anuradhapura are testimony to a civilisation magnificient in its complexity and on par with the best in the ancient western world for sheer brilliance. Capital of ancient Ceylon from 437 BC. to 726 AD. it ranked with Babylon as one of the great cities in its time. A few years ago I spent some time in Egypt of which two full days were at the Giza plateau pondering the mysteries and marvelling at the grandeur of the Pyramids. It suddenly occurred to me that the Ruwanveli Saya and the Abhayagiri dagoba in Anuradhapura were both taller than the third pyramid at Giza, and were wonders of the abcient world. The Abhayagiri dagoba constructed during the reign of King Vattagamini Abhaya (Valagamba) was an engineering marvel. The foundation of this edifice carries a weight of over a million tons of bricks. Yet today, there is no evidence that this structure has sunk even one inch ! Yes, the skills of Ceylon's ancient engineers were near superhuman, and though the chronicles do not record their names, they live on in their monuments.